As you can probably tell by the title of my blog, I am REALLY into kid fashion! I'm so excited to finally be sharing with you some of my favorite pint-sized fashion finds! I get questions on a regular (almost daily) basis of where I shop for Holiday, where to order necklaces, accessories-- the whole nine yards! I wanted to use this blog as a platform to share all of the spectacular places I love to shop and also some of the inside secrets of where to find and how to buy some more exclusive pieces. There will be LOTS more on fashion coming in the future. Today I wanted to share with you some of the fabulous outfits Holiday has been styling this Christmas season! The brands and shops featured are definitely my main "go-to" places and designers I love to buy from! So Ladies and Gentlemen (mostly Ladies), I present: Dressed in Holiday Style! I've been dreaming up this outfit for awhile, once I laid eyes on this Mini Boden Woodland Skirt. Boden featured this skirt with an adorable chunky knit gray cardigan, but by the time I got around to ordering the cardigan, it was sold out in Holiday's size, so I had to re-imagine the skirt with something else. Back to the drawing board, I went back to my "Go-To" Persnickety and thought this Corset Top from the Fall 2013 Collection might be the perfect rustic fit for this woodland skirt! I am in LOVE with how they paired together. When I first paired them, the skirt was really flat, so underneath I "fluffed" it up with the Persnickety Brown Lily Skirt also from the Fall 2013 collection. The Lily Skirt has become a staple of our fall & winter wardrobe. If you can get your hands on it, I definitely recommend picking it up! Here's a closeup of the Persnickety Brown Lily Skirt. As with all Persnickety, it's hard to see how beautiful it is until you're holding in your hands and can see all of the beautiful details! One of my main styling tricks when it comes little girls and skirts is to layer a tutu, pettiskirt or fuller skirt underneath a thinner skirt. It doesn't work with all skirts and sometimes it just makes it too full, but other times it is the PERFECT extra touch for the outfit! I love this Lily Skirt because it is beautiful on its own or serves as a great neutral color to layer underneath other skirts and dresses. This outfit wouldn't be so perfect without all of the amazing accessories. Underneath the Corset Top, I have layered the Persnickety Cream Mesh Tee. This is an item that has been part of Persnickety collections for the past two years. Don't be fooled, those beautiful cuffs on the bottom of the sleeves are not attached to the shirt! Those are the Persnickety Cream Mesh Cuffs that are an accessory you can purchase separately! The Cream Mesh Top and Cuffs are an absolute staple! We have layered these underneath so many dresses and shirts! One thing I love about many of the Persnickety Separates is how they can make other "regular" outfits SO much more special! On the bottom of the corset top, around the waist, I have tied the Persnickety Brown Sash also from this collection. Identical fabric and color of the Corset Top. A quick note on the Corset Top is that it runs in extremely snug. Holiday who normally wears a 2/3 (at 28 lbs, 38") is wearing a size 5 in the Corset Top and it was quite snug to button at that. I actually think the necklace is the main piece that ties this whole outfit together and makes it look so Christmasy! 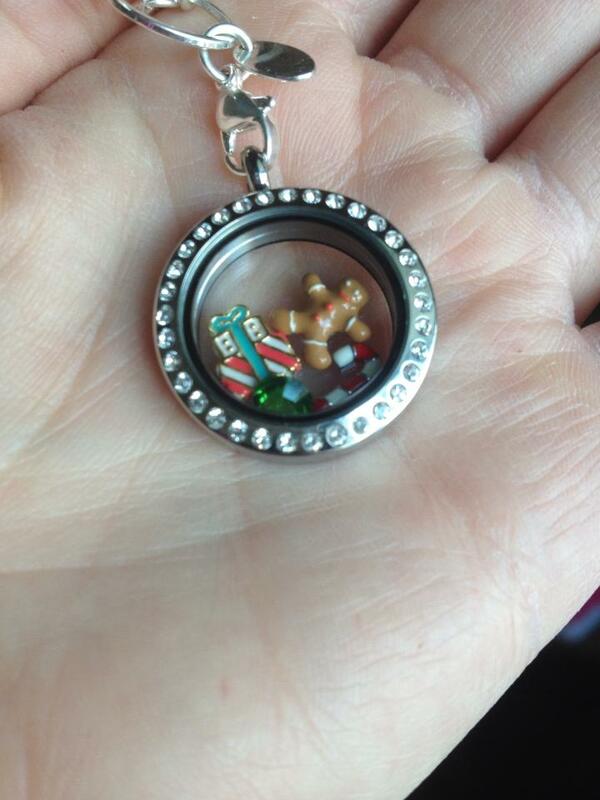 My friend Jennifer from Dazzled Darling Boutique makes a good majority of Holiday's necklaces. The headband I found on Etsy and was my first time ordering from this shop, (WOC by Nancy). It's been a great neutral headband, made well, very pretty and matches lots of our fall and winter pieces! A little better view of some of the great details on this skirt, mesh top and beautiful headband! Insert SWOON here! I just LOVE how this outfit turned out. Another one of my styling trick for littles, I bought this Gymboree sweater a size bigger than what Holiday wears so that she would wear it more like a sweater dress. The Persnickety Gray Dot Tee is from last fall, but they featured a similar top in the Holiday 2013 collection and it's also a Persnickety staple piece. One of the other many great things about Persnickety is that their pieces mix and match not only within their individual collections, but also from season to season. 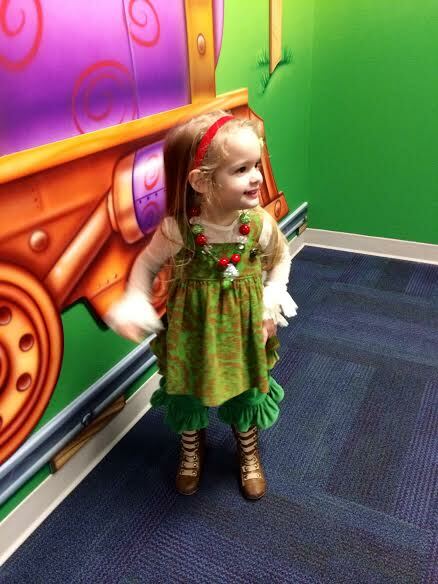 I'm honestly not a big Gymboree shopper, except for when it comes to Christmas clothes. They almost always have adorable options for Christmas and I purchased this outfit-- along with several other pieces for 50% off with their stacking coupons. Again, I feel like the accessories are what really makes this outfit special. This gorgeous headband is from Appelilly Couture. Appelilly is most definitely my go-to for special headbands and hair pieces. They are big and fancy without being obscene (at least by my standards)! This necklace is by Green Apple Girlys. She also has a Facebook page and makes beautiful necklaces and headbands! While we're on the topic of fabulous sweater dresses, check out this adorable Reindeer Knit Dress by Mini Boden! As much as I loved this dress, I was sad that I hadn't had matching accessories made to match it. I started scouring through Holiday's accessories and came across this headband from Appelilly Couture that I had made to match her Easter dress last year and realized these soft colors complimented the dress perfectly! The necklace was a M2M piece to match last spring/summer Mustard Pie. I love how this outfit is festive in a non-traditional way! It will also be a great winter outfit after Christmas is over! Now let's take a second to talk about these Joyfolie Leighton Military Boots! If you follow me on Facebook or Instagram, you've undoubtedly seen these boots more than a few times this fall and winter season. They are just TOO adorable and SO Holiday! Joyfolie makes gorgeous shoes although I have to warn that they're not always the most durable. These got nicked the first time she wore them, but it's not very obvious. They just make so many outfits all the more special. I cannot tell you how many compliments we have gotten on these boots and for the countless masses who have asked-- YES-- they DO make them in adult size! This beautiful Pippa and Julie dress was a birthday present for Holiday from some sweet friends. It is gorgeous in person. Gymboree is also my go-to for fur jackets this time of year to help make those Christmas outfits extra special! This one is lined in silk and had a gorgeous rhinestone button! These red velvety Crazy8 shoes were such a great find-- especially since they are almost an exact replica of the Joyfolie Red Julie Shimmer Shoe that we had last Christmas (at about a quarter of the price-- I picked these up for $15)! The red shoes and headband really make this outfit so Christmasy and give it that bold touch of color it really needed. I needed a red and gold headband that was ready to ship so when I need something quickly, I often search Etsy for exactly what I'm looking for. This headband is GORGEOUS-- I just LOVE how it ties the whole outfit together! It was my first time ordering from KFaith Couture, but I'm sure I'll be browsing her Etsy shop again in the future! Holiday took it upon herself to add her own accessory-- these fur cuffs which are actually slap bracelets from the 80's/90's that used to belong to me and are now in her dress-up accessories! 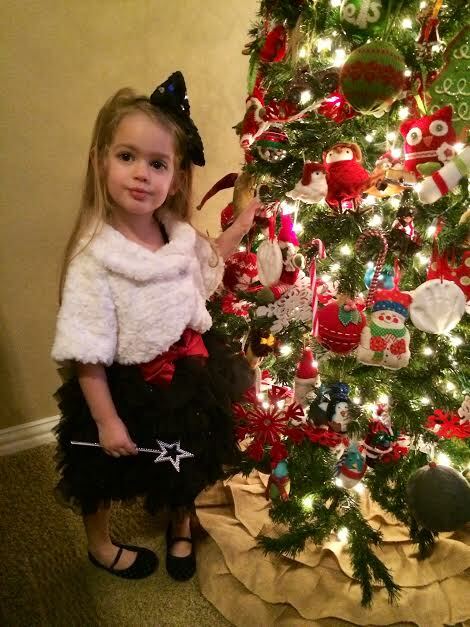 While we're on the topic of fancy, here is this adorable dress from Ooh La La Couture. When Christmas dresses started coming up for the season, I was disappointed in the offerings from Persnickety so I started looking elsewhere and stumbled upon this dress. Works great with the Gymboree cropped fur jacket. For cooler weather, I have the Gymboree black shimmer tights to pair with this! This picture is a tad blurry, but here is the dress paired with a M2M necklace from Dazzled Darling Boutique! Holiday insisted on wearing these Hatley Rain Boots with this outfit (I've paired it with her Black Ugg Bailey Bow Boots)! Again, another great Christmas wardrobe find from Gymboree. I also sized up to a 3/4 in this sweatshirt so that Holiday could wear it more like a dress. It is so comfy and she LOVES that it has pockets! I love this option because the big chunky beaded necklaces Holiday likes to wear don't always work well with every outfit! Paired with this Gymboree top, I love how the necklace doesn't cover up the adorable wording on the shirt! This outfit didn't photograph all that well-- it is much prettier in person, but another fun combination for the Christmas season! I love how festive these Green Velvet Mae Shorts look under the red skirt! This was an outfit I put together for a Persnickety contest a few months ago mixing and matching pieces from different seasons and collections! This Peter Pan collar added to this otherwise plain shirt really does make the shirt (and the outfit extra special). To make the outfit extra fancy, I added the Persnickety cream mesh cuffs under the sleeves of this Basic Ruffle Tee! Another fun, more casual Christmasy outfit pairing a Gymboree shirt with these adorable Persnickety pants! Quinn's Closet is one of my MOST favorite handmade boutiques and I built this next adorable outfit around this Tree Trimmings Tilly Top! When Holiday heard that Santa Claus was coming up the street, she shouted, "I have to be Mrs Claus!" We just happened to have this dress up apron that I had made for her last year from my favorite go-to boutique for unique costumes, Ross and Rosie Designs (She has an Etsy shop and Facebook page). 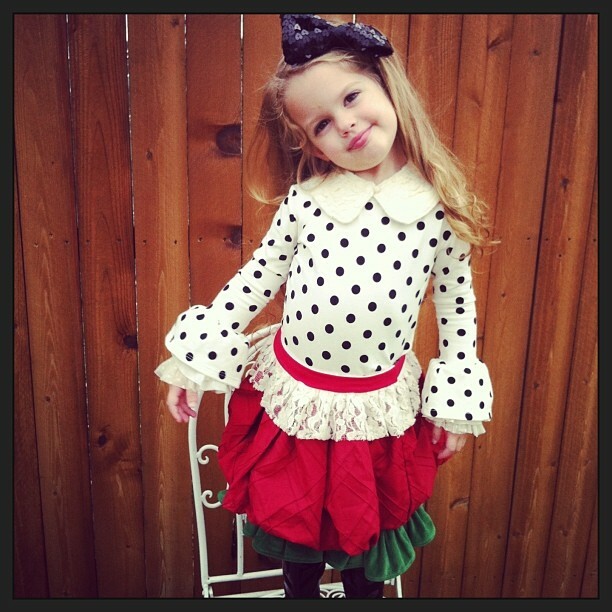 Although this is a "dress-up outfit" in my opinion it is adorable enough to wear to any festive Christmas gathering! The details and workmanship are just gorgeous and Holiday has SO much fun dressing up in her Ross and Rosie costumes! Even Santa liked her outfit so much, I got an email from Mrs Claus telling me all about how Santa couldn't stop talking about Holiday and her outfit! The back of this jumper is especially gorgeous! JUST FOR OUR READERS: Use code: FREESHIP4U to receive free shipping on your purchase on the AppelillyCouture Etsy page (link above)! JUST FOR OUR READERS: Use code: 10OFF to receive 10% off on your purchase from Green Apple Girlys Etsy page (link above)! Be looking for some exciting features with Quinn's Closet coming up in the New Year!